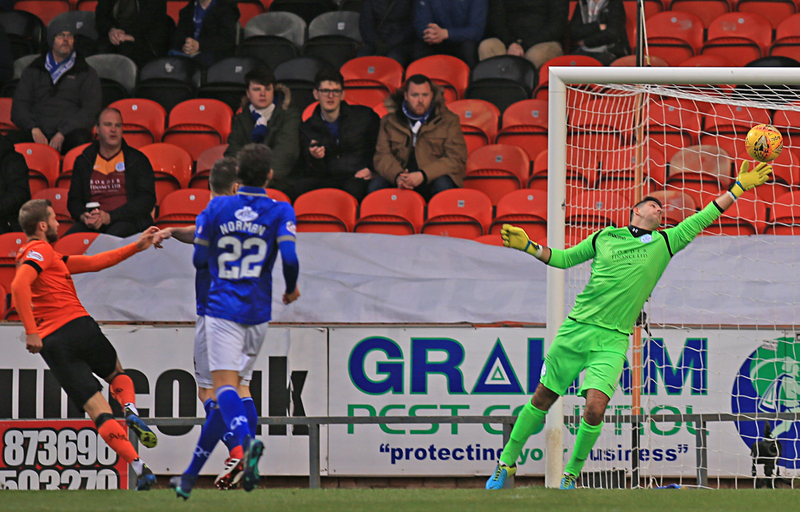 Queen of the South?s third game in seven days was a largely forgettable one, as Dundee United came out 2-0 winners at Tannadice. 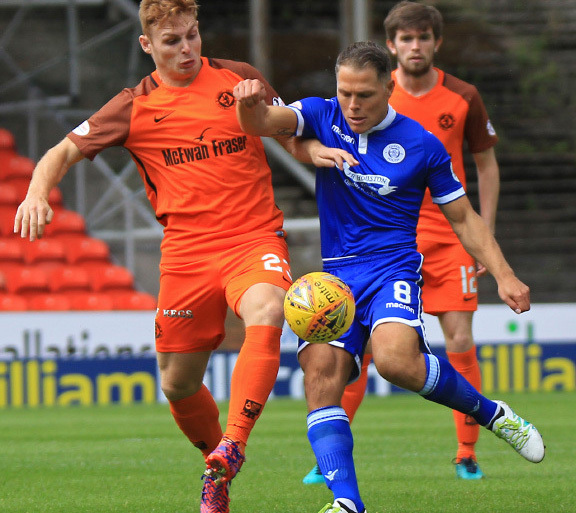 Gary Naysmith went for the same line-up that played againstMorton, playing a 4-1-4-1 formation with David Norman JR sitting between the lines, and Stephen Dobbie playing as the lone striker. A late change to the Dundee United line-up seen William Edjenguele come in for the injured Frederic Frans. Adam Barton took Edjenguele?s place on the bench. 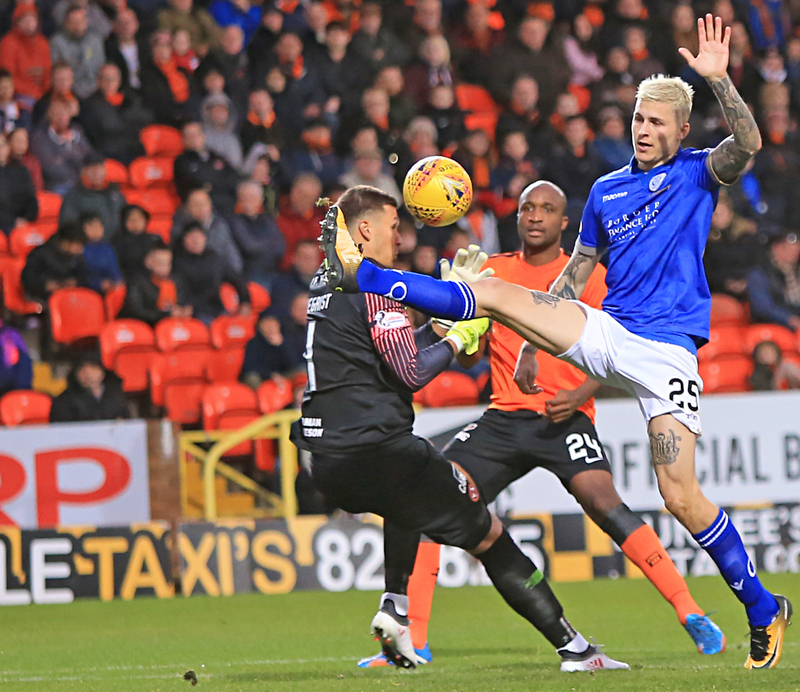 It was Queens who got the game underway and, after a scrappy opening couple of minutes, Dundee United took the lead through Pavol Safranko. A loopy Paul McMullan cross from the right hand side gave Safranko a free header and he made no mistake of putting it past the onrushing Alan Martin. The goal felt like it came from nowhere as Queens just switched off for a few seconds; a mistake that cannot be made against opposition of United?s quality. There was an injury scare for the visitors not long after the goal, as Mikey Doyle went down clutching his ankle after seven minutes. However, although it appeared bad, the versatile defender soldiered on. Doyle went down again, and not long after, Safranko missed another free header from 12 yards out, which he struck narrowly over the bar. Doyle was able to play on, and he, along with the other 10 men in blue, were doing well to keep up with United?s energy and prevent them from creating any real openings. 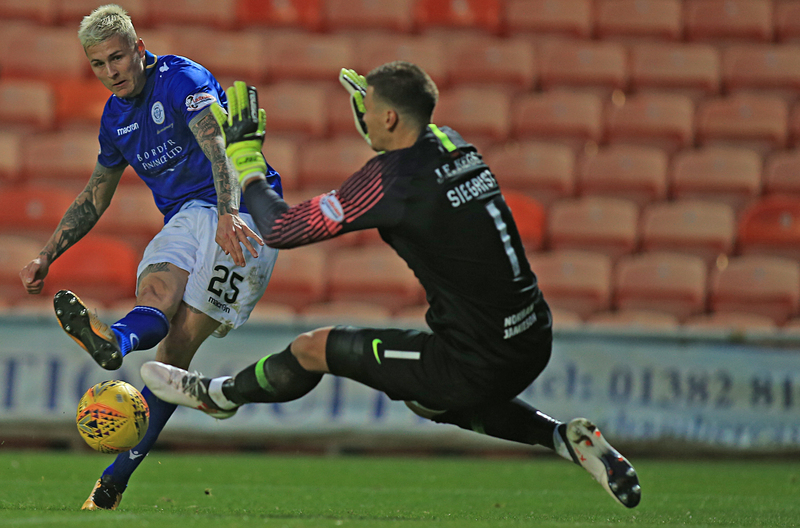 Fraser Aird and Billy King both had long shots, while Fraser Fyvie had a free-kick from 22-yards out, but none of them caused any problems for the league?s joint top clean sheet holder Alan Martin. Queens were struggling to keep the ball though, and although they were able to prevent United from creating anything, the away side didn?t create much themselves. A low Jordan Marshall cross was probably the best move for Queens in the opening 45 minutes, which no one was able to get on the end of. The half was closed by a booking for either team. Scott Mercer was the first man in for a dangerous tackle on Aird, while Safranko was the next man in for dissent. The one-nil lead was probably a fair reflection of the first half, however the goal was easily avoidable. Although possession was dominated by the hosts, Queens done well to match their energy and prevent any chances getting created. It was clear at the start of the second period that Queens would not sit back and lie down for the ?Arabs?. Stephen Dobbie?s acute chip to Lyndon Dykes was almost met, but Benajmin Siegrist in the United goal was just too quick for the big Aussie. The first change of the game seen Callum Semple replace Mercer, with Doyle moving out to right-back and the Sheffield United loanee slotting in at centre-half. Indeed the new Queens right-back was the next man in the book for a professional foul on King as the home side looked to break. 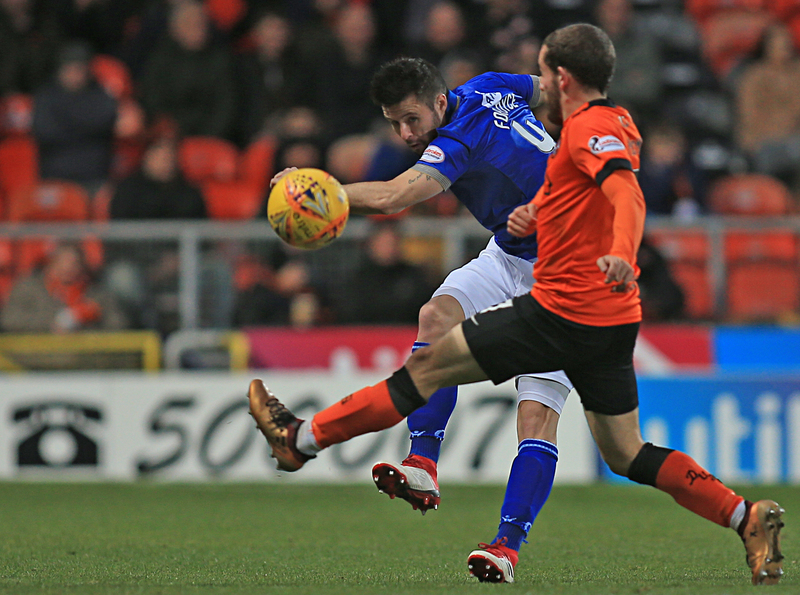 Doyle rode his luck on another couple occasions as he committed a couple more fouls that, thankfully, went unpunished by referee Craig Thomson. Queens? 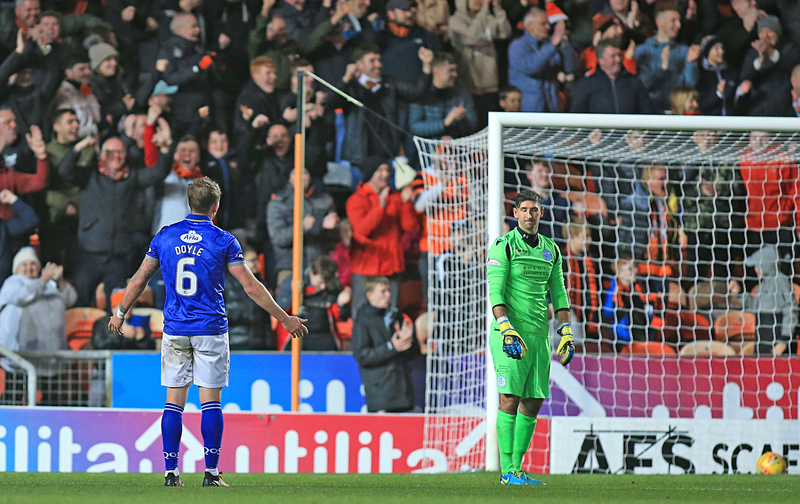 joint all-time record goal scorer in a single season, Nicky Clark, came on for Dundee United. The ex-Queens man scored 41 goals in the 2012/13 season. Stephen Dobbie is already on 25 this season...could it be broken? Queens continued to push for an equaliser and for a period of time it genuinely looked like coming. An error by Rachid Bouhenna at the back saw Dykes go one-on-one with Siegrist, but the Swiss shot-stopper parried it out for a corner. At 73 minuted there was a welcome return to first team action for Gary Harkins, as he replaced Andy Stirling. Harkins was met by cheers from the 169 Queens faithful, but the home fans serenaded him with a chorus of boo?s...I wonder why? As Queens went more direct searching for an equaliser, Dundee United were able to put real daylight between the teams, doubling their lead in comical fashion on 81 minutes. As Doyle was chased down by the impressive Paul McMullan, his back pass to oncoming Martin flew past the Queens goalie and into the bottom corner of the net. The second goal was slightly against the balance of play in the second period, and really took the wind out of Queens? sails. The last 10 minutes were seen out somewhat comfortably by the Tangerines and, apart from a Kyle Jacobs booking, nothing of note happened. So another disappointing defeat for Queens, and what was really a self-inflicted one. United has more of the ball, and more shots on goal, but Queens done exceptionally well to limit them to half-chances throughout the game considering it was the same 11 that started on Tuesday. However, United took all the spoils as Queens drop to 6th in the table - albeit only three points from the play-offs. Next week the Doonhamers are unfortunately not ?doon hame? although we?re not far from it as the South travel to Somerset Park to take on top-of-the-table Ayr United. This tie will bring back fond memories of the 5-0 demolition job that was struck on the Honest Men in September - let?s rally behind the South and get back to winning ways.